The Baltic Sea, The Eastern Sea... It does not matter how you call it. It is our sea and it is the most polluted sea in the world. Horrifying, isn't it? This is why we must become active. And we do - by organizing the "Baltic Sea Infotour". » What is the Tour? » How do I participate? The Baltic Sea is one of the most radioactively polluted water bodies in the world (PDF flyer) - thus we think it is important to inform about nuclear power and its risks. 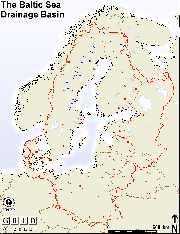 The idea is to arrange an infotour around the Baltic Sea in summer 2010. That way we want to come in contact with local initiatives, carry out actions, take part in information events and organize some of those events ourselves, have network meetings with local activists, spread information about nuclear issues and maybe other topics, too. 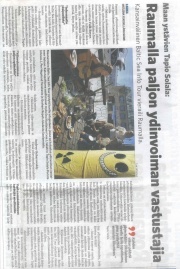 The Baltic Sea Info Tour will inform about nuclear power and its risks as well as about the renewable alternatives. 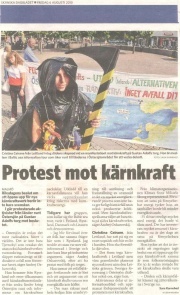 The Tour group will travel around the Baltic Sea in summer 2010, informing and emancipating young people and calling citizens of all ages to raise awareness of the challenges of nuclear industry and current development surrounding the Baltic Sea area. The Tour is arranged by different groups, organisations and individuals who share the concern of radioactive pollution. The Tour topics will be arranged by local people. Everyone can take part and join the Tour by informing, arranging local action, joining the network meetings, spreading information about nuclear issues or just showing up in the events. Every step counts! The tour is an informative event, dedicated to the Baltic Sea, embracing the communities surrounding the Baltic Sea. We want to discuss the challenges with people living across the Baltic Sea and to give more information about certain issues connected to radioactivity, nuclear power and renewable alternatives. The Baltic Sea Info Tour will consist of different kinds of activities: street actions, information events, workshops, performances, discussions, local gatherings, spreading of flyers and posters. The Tour will include several stops in the Baltic Sea countries. It will start from Finland in June and end again in Finland in August 2010. Please see the timetable of the stops near you for more information. The Baltic Sea is one of the most radioactively polluted seas compared to other water bodies in the world. This has happened mainly because of the radioactive releases of nuclear power plants in the Baltic Sea area (mostly due to Swedish and Finnish power plants), the radioactive particles distributed from the Chernobyl accident, nuclear bomb tests in the atmosphere and Sellafield’s discharges. 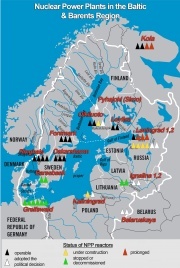 Also the Russian and Lithuanian reactors increased the amount of radioactivity in the Baltic Sea. Additionally the proposed uranium mining projects and final disposal sites as well as nuclear transports are strengthening the risk of pollution for the vital sea between Finland, Russia, Baltic States, Poland, Germany, Denmark and Sweden. Including the impacts of uranium mining, processing of the ore to produce nuclear fuel and the disposal of the created long-life nuclear waste, the operation of nuclear power plants has an immense impact to the global warming. Nuclear power is expensive and dangerous and the resources used in the nuclear industry would be more beneficial for present and future generations if spent in renewable energy systems. 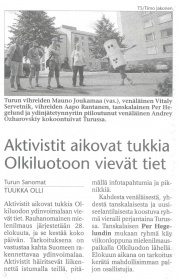 The Info Tour has started as an action of concerned people of the Baltic Sea community. The tour will inform people about the facts of uranium energy and radioactive pollution of the Baltic Sea. The tour will activate and emancipate people to take part in the events of the local stops. The Tour will advance active courage both locally and in large social and ecological systems. Immediate Closure of All Nuclear Facilities - Worldwide! The idea of it arose at the NUCLEAR weekEND in Isnäs (FIN) in October, 2008. A first bigger planning and promotion meeting (Minutes) took place at the Youth Environmental Congress in Frankfurt/Main on 1 January, 2009. On April 17th-19th, 2009 another preparation meeting (Minutes) was organized in Stockholm. A virtual meeting was held on June 13th, 2009 via Skype. The Tour's project was also presented at Nuclear Climate Camp in Tervola, Finland in July 2009 where new poeple joined the project. Another prepartion meeting was held at the Youth Environmental Congress near Hamburg from December 25th, 2009 to January 2nd, 2010 and the next one took place at the International Anti-nuclear Network Meeting on March 25th-29th, 2010 in Helsinki. A "Western Baltic Tour" preparation meeting took place in Greifswald (D) on April 26th-27th, 2010. The last preparation meeting was held in Bonn (D) on May 31st-June 2nd, 2010. The Tour itself takes place in summer 2010 from June 22nd to August 21st. One central project within the infotour project will be to create a map showing the locations of all kinds of nuclear activities in the countries around the Baltic Sea and compiling information about them. The idea is to distribute this map and information on the tour. It will also be a helpful tool for planning the tour (route, contacts, issues etc.). We will use this subpage for gathering and compiling the information. Lithuanian national radio "Ziniu radijas" had a report on the tour. This page was last modified on 6 June 2015, at 13:24. This page has been accessed 207,495 times.